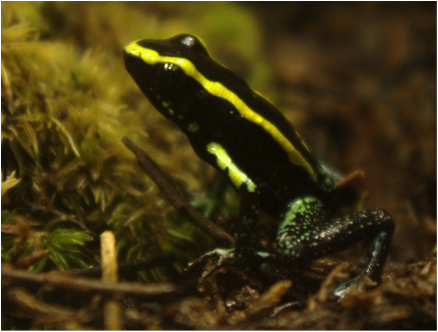 Batrachotoxin A from the poison dart frog Phyllobates aurotaenia. Carbon atoms in brown, oxygen atoms in red and nitrogen atoms in blue. Today is Isabella Karle’s birthday. A leading crystallographer who in her early career worked on the Manhattan project to synthesise plutonium compounds, but became famous for solving the structure of the toxin found in the skin secretions of South American poison dart frogs. Isabella worked with her husband Jerome Karle at the United States Naval Research Laboratory. Jerome Karle won the Nobel Prize for chemistry in 1985 with Herbert Hauptman for their work in X-ray crystallography. Although Isabella didn’t win the Nobel Prize she scored a huge number of awards and prizes in her own right including the US National Medal of Science. The toxin shown here is batrachotoxin from the glands of the Dendrobatidae family of frogs found in South and Central America. Native South American tribesmen coat the tips of their hunting darts with the skin secretions of the frogs to give the darts added lethality. The batrachotoxin is extremely lethal requiring only 100 micrograms (or 0.0001 grams) to kill an average sized adult. Batrachotoxin is a neurotoxin and works by binding to the sodium ion channels found in neurons. When batrachotoxin binds to the sodium ion channels the pumps remain permanently open stopping the messages from travelling along neurons and leading to paralysis and heart failure. Batrachotoxin from frogs consists of three molecules: batrachotoxin A, isobatrachotoxin and pseudobatrachotoxin. The structure shown here is batrachotoxin A that has an additional p-bromobenzoate. The toxin consists of a steroidal structure with its three 6 carbon rings and one 5 carbon ring linked together, and is also an alkaloid due to the presence of the basic nitrogen. The structure was solved by T. Tokuyama and colleagues in 1968  and the structure shown is from the Cambridge Structural Database and published by Isabella Karle in 1969 . This entry was posted in Biological structures, Molecular Structures and tagged frog, Historic, LeBrun, Toxic by crystallography365. Bookmark the permalink.